Wednesday, February 16: Powder Wednesday. 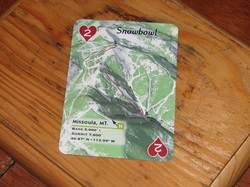 It surprised me that Snowbowl was a card, because of its size compared to all the other western mountain cards. But it deserves to be there. Snowbowl is going to have a special place in my memory and heart for the rest of my skiing career I think, even if I never make it there again. It definitely put Missoula on the map for me. Besides the fact that Missoula was a cool town, with fun places to go out, and nothing but good people around, the mountain was blanketed with a foot of freshies for my arrival, and it snowed all day long. Online they only reported 4" so I was sharing the place with what felt like only 20 other people. I skied with locals Andy and (son) Alex, and they showed me the best of the best, and we went all day long, rarely repeating a run. There are only 2 lifts, so you cant get lost, and the fact that those 2 lifts are (slow) doubles, gave me good recovery time between runs. I still managed to be dog slow compared to the other guys, but I enjoyed myself immensely. Check out the random pictures of Missoula, MT during the day I was kicking around.